We are the premier source for all of your cabinet needs. Craig’s Cabinets can build home office cabinet systems, entertainment units, bookcases, and more! We offer real wood, quality kitchen and bath vanity cabinets, made in the USA. Proudly serving Raleigh, Cary, Wake Forest, and surrounding areas. We have friendly personal service, absolutely professional, and offer honest pricing. Whether you want to remodel one bath, put in a home office, or create the kitchen of your dreams. Your satisfaction is our goal, Put our experience to work for you. Give us a call today! Craig prides himself on providing every customer with the very best of his cabinet making skills. He hand draws every plan, taking the time to make sure every dimension is perfect. Craig's Cabinets knows that the possibilities of home cabinets are endless. Check out our gallery for cabinet ideas! Craig's Cabinets specializes in Kitchen Cabinets, from the very smallest of kitchens to large luxury kitchens. 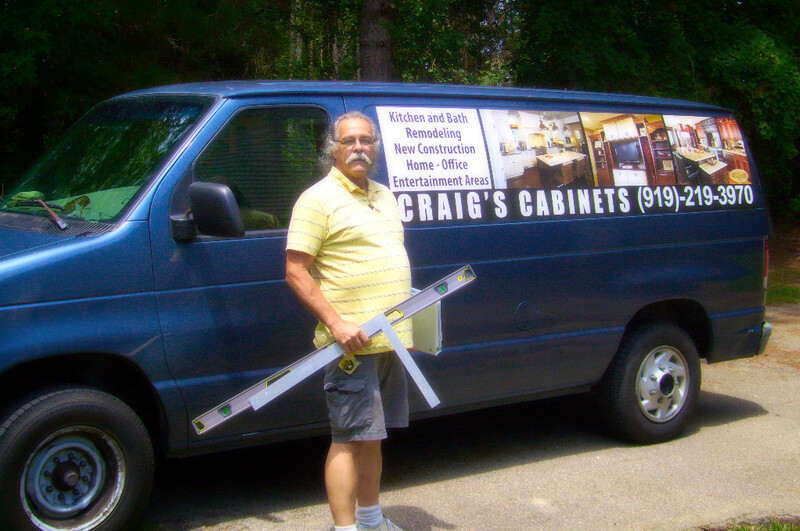 Craig will visit your home and create a custom plan to fit the look and style of your kitchen. From design to installation, Craig's Cabinets can make your home kitchen dreams come true. Every bathroom needs cabinets! Give Craig a call today to get the perfect style bathroom cabinets for your home. Having extra storage space for personal items, towels, and all those little bathroom extras is very important. Craig's Cabinets has the bathroom cabinet solution for you! "The cost for me to erase a line or two and draw new ones, is nothing. Changing your mind after the cabinets are made, costs money. I always tell people, the more time you spend thinking about the plan and really tweaking it to get it like you want it, the better you will like the finished product." Let Craig help you save money and get what you REALLY want out of your cabinet plans. Even if you already have drawings and specs made, Craig takes the time to go over everything with you and make sure it's right. Sometimes, there are tweaks to be made. But that's ok! It's better to measure twice and cut once! We use Showplace products for a unique combination of design flexibility, product quality & expressive creative options. From a spacious kitchen remodel to a cozy office bookcase, I will make sure the cabinetry looks and feels the way you intended it to. Many customers ask if I build custom cabinets. While I do not directly fabricate custom cabinets myself, The Showplace brand offers many standard options and accessories to the cabinets they produce. Additionally, I can have individual custom cabinets built to exact specifications. So, whatever cabinet you need, wherever you need it, we can make it happen.